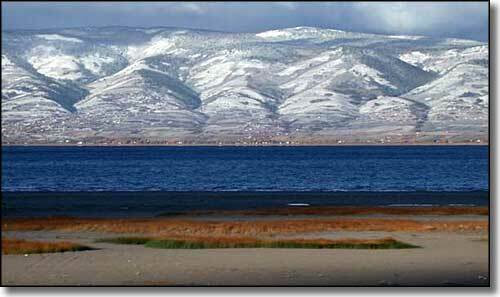 Bear Lake is in the extreme southeast corner of Idaho, about 5,900' up in a high mountain valley. The lake is about 8 miles wide and 20 miles long, with half the lake in Idaho and half in Utah. There is a 1.5-mile-long beach on the eastern shore and another 2-mile-long beach on the northern shore. The lake bottom has a very gradual downslope so the swimming area is huge. There are several boat ramps on the lake so boaters and waterskiers came have a really good time, too. The major part of the State Park is along the eastern shore, with a campground offering 47 individual and 3 group sites. The fishing is excellent year-round with native cutthroat and lake trout in the summer and Bonneville cisco in the winter. The park grooms almost 300 miles of snowmobile trails in season. 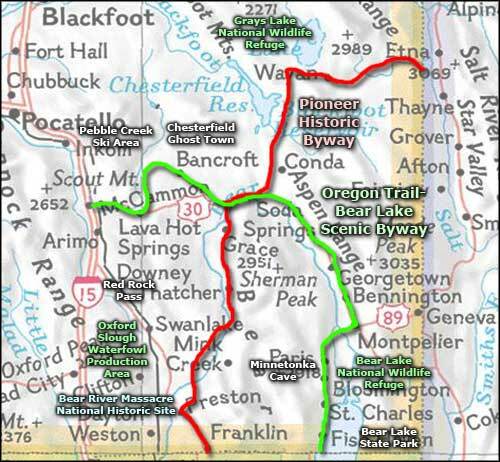 On the western shore of the lake are the Cache Mountains, with miles and miles of hiking, biking and motorized trails. Bordering Bear Lake State Park to the north is the Bear Lake National Wildlife Refuge with great year-round bird watching. Photo of Bear Lake State Park courtesy of Matthew Trump, CCA ShareAlike 3.0 License.